OK, triazole CH donors can bind anions. Among 40 million compounds known to mankind, 97% of them have CH groups. Find others that are good as triazole CH donors. Yes, I want to find my own CH donor as well. Hmmm.... what do I need? Oh! What was that awesome compound I saw at a conference back in 2008? ​Right! cyanostilbenes by Prof. Sooyoung Park! ​1. CH group - check! 2. electron withdrawing group - check! ​3. Should be easy to synthesize - double check! dirt easy. Now let's design some simple anion receptor with this. Simple and easy-to-make acyclic and macrocyclic receptors. TA DA ! What do you think Amar? ​Nice idea. But that macrocycle is ugly! Come up with a better design! Hmm... what is wrong with this? Let's cut one bond and see what this compound wants to do. Looks like it wants to have five repeating units instead of six. But that's an odd number. I cannot make that using the two building block system. I need a single building block that has both cyano and aldehyde groups. But I would need a miracle get this to actually work. 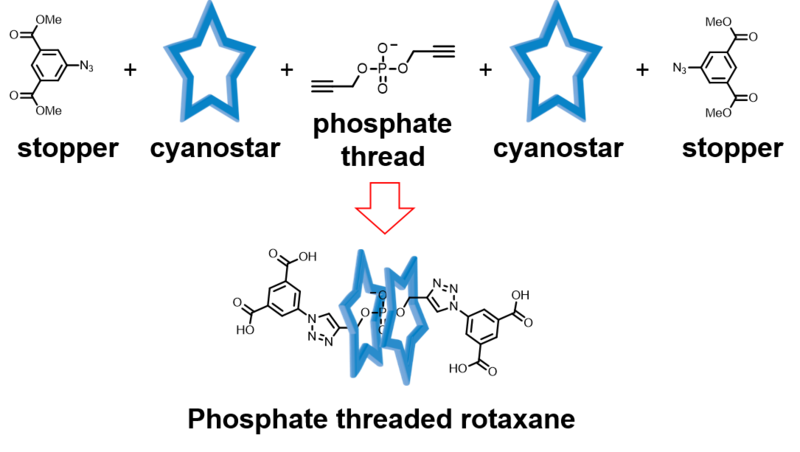 Five irreversible bond formations in a single reaction. Time to pray to the macrocycle gods. IT WORKED !?!? 81% yield? This unexpected. Ha! It even likes to grow into pretty crystals. Want to take a look at the new macrocycle I made? It has cyano groups and shaped like a star. cyanostar? maybe cyanobeul (별, beul, star in Korean). A Korean name would be awesome. Too difficult to pronounce. CYANOSTAR it is. By the way, do you know what would make this macrocycle even cooler? A rotaxane. Put an anionic thread through it. I need a linear compound with an anion in the middle. Well, nucleotides are connected with phosphate anions to build DNA. Maybe, I can borrow that concept. Perfect. Time to write the paper!